This book was suggested to the instructional designers at KCELT, Wilson Rojas and I, to provide the philosophical foundation for participative learning events, by one of the organizers of the Chicago EdCamp in late October 2013. An EdCamp model was something that intrigued me ever since it was suggested to KCELT by one faculty member in late spring 2013. When Wilson and I attended the EdCamp in Chicago, I was impressed with many but not all of the features, and I thought that KCELT could emulate the features that worked well and seemed to meet the needs of Kirkwood Community College. The EdCamp model works best for educators from different institutions. If we were to host a participative learning event solely for Kirkwood faculty, then Open Space Technology is more appropriate. Hence, this book was suggested. My first impression of this book was not good. I must admit that my first impression is from the viewpoint of a researcher and not of a practitioner. I was immediately dismissive after discovering that there were no cited sources and no references section. This is a first-person account of the successes (and a few failures) of Open Space Technology. I had to remind myself that researchers are not the intended audience. Even as a practitioner, I am alarmed by the lack of cited references. However, when reading through the first few chapters, I found that the author does refer to certain events where OST worked, but we have to take his word that these events happened. Seeing that there were cited sources, I went to check out the “About the Author” section to check his credentials. He distanced himself from academic circles (his choice?) to work with government organizations. A lot of his inspiration comes from his experiences, and his choice of words seems to denote that he is connecting the worlds of myth, ritual, and culture to the government and private enterprises. This brings me to the assumption that he does not invoke the scientific method to much to come to his conclusions. This book is based on personal experiences and observations with no control for his bias, so it reads like a bit of a sales pitch. I started reading this book with a higher-level of skepticism than most teaching philosophy books. As an instructional designer for an institution, I found several concepts appealing because they embraced a more bottom-up ideology than top-down. The first few chapters provide a mindset for the designer who wants to change from implementing top-down professional development events to more bottom-up ones. The traditional top-down professional development arises from an administrative department or an individual as an idea like, “Our faculty need these skills/knowledge/behaviors. Let’s provide them an opportunity to get them.” There is very little consultation with the faculty in developing this event, thus placing planning and too much control on the individual or group that provides the “training.” According to the author, this sends a message to the attendees that the planners and organizers know what is best for the participants. The mindset for preparation is presented in Chapter 2 in the section titled Focus and Intent. 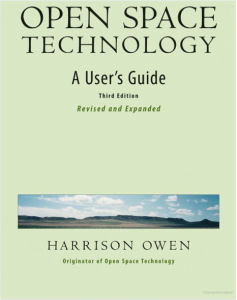 Here the author writes, that “Open Space Technology runs on two fundamentals: passion and responsibility. Without passion, nobody is interested. Without responsibility, nothing will get done.” Instead of preparing an event, the organizers prepare a theme that evokes both passion and responsibility. The organizers need to relinquish control of the content as many participants will have the knowledge or skills that others need. I like how the author suggests that the organizers be more worried about passion and responsibility than the numbers of attendees. It is better to have a few passionate and responsible faculty than an auditorium of slightly interested, mostly bored and maybe even frustrated faculty. We, and I hope other education institutions, want participants who are committed to learning, growth, and development. This commitment should show the organizers the true potential of their organization. Another important aspect to this philosophy is to value that I like is flexibility over rigidity. The professional development event is for the participants and not the organizers. Rigidity shows when the organizers want to impress the participants, but open source technology helps the organizers change this mindset. Participants will be more impressed by the organizers’ flexibility of giving them the time and space to discuss the issues that are important to them. If nobody else finds the issues important, this approach allows other participants to leave the room. Nobody should be forced to stay. Creating time and space should be the top priority for the organizers after a theme has been selected. Content in the form of PowerPoint presentations and videos should not even enter in the planning part until the end. These typical elements of an event are left to accommodate the structure, to help participants learn how the open source technology approach works for their context. The Fourfold Way is discussed in depth in chapter 4. To summarize, participants need to be there, respect and listen to others, be honest to oneself and others, and realize that they have no real control. The urge to control is the worst obstacle to this approach. This is a great metaphor for learning, and it may help teachers reflect on their own practice. Are they more interested in learning or schooling, the latter of which is more concerned with control? Chapters 5-9 appealed to me because they most resembled what I discovered when participating in the EdCamp in Chicago. Organizers, who think they already have the mindset or have already attended an EdCamp and liked it, can start designing their own participatory learning events by using these chapters as guidelines. However, it is important to verify that one has the mindset as shared in Chapters 2-4. Beyond my first impression, I only have two criticisms. The first is objective and the second is subjective. First, Chapter 3 is outdated. Anyone who has attended an EdCamp will immediately understand why as mobile devices, Twitter, and Google Drive have made the process much simpler. If the organizers are skilled with these tools, then the process is much easier. Second, I didn’t like the “Talking Stick Ceremony” at the end of the event. It was my least favorite part of the EdCamp experience because my colleague and I were outsiders for the most part. This ceremony was more relevant to nearly everyone else who were K-12 educators in the Greater Chicago Area. I like the main idea of giving the participants the last word, but I wonder how many participants were still engaged by this point. Chapter 9 provides an alternative, but I believe organizers can develop better alternatives that best suit their contexts. I view this book to be a philosophical guidebook first and a event organizing process book second. My biggest issue is that there is not enough evidence that it works. However, the EdCamp model seems to be very effective for some educators and it is going strong across the United States. As a researcher, I wonder to what extent is the EdCamp model helpful. I only have one experience so far, but I am looking forward to joining another EdCamp soon with my colleagues and implementing a similar model here at Kirkwood with KCELT. Jeremy, glad that you eventually found this book helpful. We as Team KCELT will be going to EdCamp Iowa in March and I certainly hope that we can come away with some ideas that can inform the way that we plan our learning events to be more participant driven.